While different destinations in south east Asia are regarded individually as hot holiday spots for young singles, party-goers, honeymooners, families and seniors, Koh Samui has a place for everyone! Known as one of Thailand’s most beautiful and romantic islands, it is no wonder 1.5 million people holiday here every year. 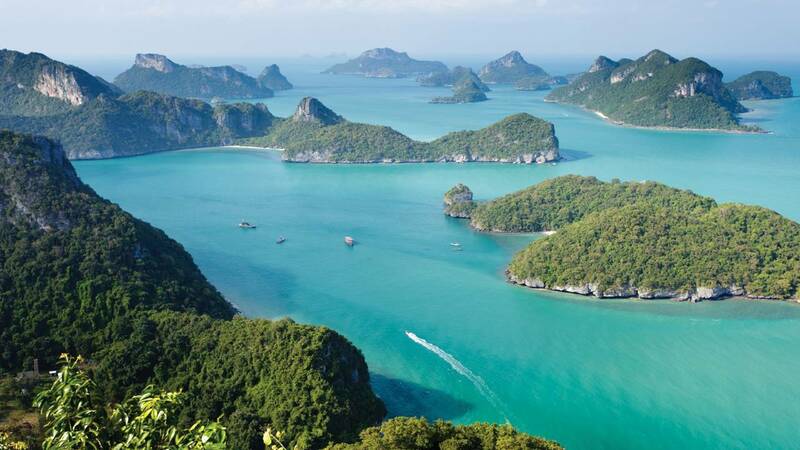 Samui - as it is called by the locals - is Thailand’s second largest island after Phuket and lies off the east coast of Kra Isthmus in the Gulf of Thailand. Samui has a population of over 50,000 and covers an area of 228.7 square km. The beauty of Koh Samui that attracts 1.5 million tourists each year is the white sandy beaches, coral reefs and tropical environment. Also most things are very cheap compared to western prices. ​Escaping to a tropical island with friendly locals and perfect weather is what many people consider the perfect holiday. Some would even say it is their Best Holiday Destination. Many couples choose Koh Samui for their honeymoon destination or as a romantic getaway, with perfect temperatures and beautiful beaches making it a relaxing dream holiday in the sun. There are plenty of backpacker bungalows right on the beach where backpackers from all over the world come for one week, one month or just forget to move on. In a melting pot of cultures, the freedom and carefree atmosphere ignites great friendships. There are also plenty of upmarket luxury resorts on Koh Samui that appeal to the rich and famous. Set in secluded locations overlooking spectacular coastline is often where high profile people choose to escape. Probably the biggest group of people attracted to Koh Samui is your average tourists. As a family holiday destination, Koh Samui is perfect with relatively cheap accommodation and plenty of family friendly restaurants. And it is a popular destination for seniors and retirees, who can simply enjoy the relaxation after decades of working and raising their families - in fact Koh Samui is rapidly growing as a retirement destination. ​We had a fabulous time and found lots of things to do between our walks on the beach, massages and cocktails looking over the white sand and listening to the lapping of the waves. ​Koh Samui is made up of hundreds of shops, restaurants and entertainment venues mainly found along the eastern side of the island with main townships such as Lamai Beach on the southeast, Chaweng Beach which is on the central eastern side and Bophut (Fisherman’s Village) on the north east side. These three areas are the most popular with tourists, with Chaweng Beach being the most densely populated and also the noisiest at night. Chaweng Beach attracts mainly the younger generation who want to party till late. However, if you want to be near the “action” but still have a peaceful holiday I suggest either the northern or southern end of Chaweng so that you are still within walking distance but it is not too noisy to sleep (our accommodation was perfect). Koh Samui has a tropical monsoon climate with warm humid weather most of the year. However, in comparison with Phuket it is relatively dry. This adds to the holiday culture, with plenty of outdoor beach restaurants and massages along the beach in abundance. The first thing you will notice in Koh Samui is that there are lots of motorbikes and scooters. Although this is a great way to get around the island and have fun you must be VERY cautious as there are no speed limits and very few rules. ​Many tourists forget their general safety when on holidays and this can be tragic. ALWAYS wear a helmet and some clothing protection if you can. There is one main road that runs all the way around the island and several smaller roads leading off the main road. Maps are readily available so there’s not really a problem in getting lost. Taxis are in abundance, particularly along the eastern coastline and prices are usually set; however it is a good idea to ask first and agree on a price. We found it very cheap to get around by taxi and on one day we had an air-conditioned van from our resort with a driver for the day, which was very cheap. Tuk-tuk style utes are another option. They are cheap for one or two passengers but if you are in a group of 4 it is cheaper to get a taxi. There are so many types of accommodation in Koh Samui it is easy to find something to suit your style and your budget. The most important decision is WHERE you want to be. If you want to be close to the beach (and level so you can walk straight onto the beach from your resort) you probably need to be more on the east coast. This is why Chaweng is the most popular destination and has the biggest concentration of resorts are in this area. Always check this before you book! Some resorts are set high on the hill or overlook the part of the ocean that has no beach, just rocks. This may be perfect if you want seclusion or just to relax in your resort but keep in mind to get to the beach it may be a steep climb down the rocks and back up again. We chose Samui Resotel Resort & Spa was because it was level with the ocean, close to everything and had its own private beach with chairs and umbrellas to enjoy - and we certainly were not disappointed! There are currency exchange places everywhere and most don’t charge a fee to exchange your money if you have another currency. Exchange rates are displayed on a board outside and it’s very safe to change money here. If you use an ATM you should take as much as you will need because each transaction will attract a currency exchange fee from YOUR bank. There are plenty of great restaurants to choose from in Koh Samui and every type of food that you’d like to eat - Thai, Indian, Italian, Irish pub, Japanese, Mediterranean, Seafood etc (we didn’t see any Aussie meat pies though)! Seafood is VERY popular and there are lots of great restaurants displaying their seafood in trays of ice for you to see. Beer is Very cheap, but wine is quite expensive. I am sure you will enjoy trying lots of different restaurants – be guided by the number of people in the restaurant. Chaweng beach is a popular eating spot with lots of restaurants set up on the sand. Often part of a resort but they are open to anyone. Fisherman’s village is the place to be on Friday nights, Nikki Beach for Sunday lunch and if you want a romantic night out try one of the upmarket restaurants that sit on the rocks above the beach such as Six Senses Hideaway. We often ate at our resort (Samui Resotel & Spa) because the food was so good and we were usually very tired after a long day. Carry plenty of small change in the local currency – some vendors will not be able to change your big notes. Carry 100’s rather than 1000’s. Tours & Taxis..... only book with reputable tour companies as they are properly insured...... decide on a price with your taxi driver BEFORE your journey if he doesn’t have a meter. Carry a photocopy of your passport.......... carrying ID is a MUST in Thailand. Always carry a photocopy of your passport and keep your original in your hotel safe. Thai police can stop you at any time for no reason and ask to inspect your ID. If you spend more than a day in Koh Samui you will soon get accustomed to the expression “Same, Same”. It is the lilting way of the locals to explain that something is the same as something else (for example, at our resort it was no more expensive to have room service as it was to dine on the restaurant – same, same). We also discovered to our surprise that some establishments, mainly restaurants and bars, also have a “plus, plus” policy – the advertised price plus 10% value added tax plus 7% service fee, which adds 17% to the total price! So a great tip when you are looking at a menu is to read the very fine print, or ask if the prices are plus, plus! Power: Electricity supply is 220 volts - plugs have two round pins. ​Currency: The local currency is Thai Baht (THB). Depending on exchange rates at the time, 100 THB is around $4.30 AUD or $3.00 USD.